Of course, this requires a sufficiently intelligent setup, which may be a barrier for first-time users - those who don't realize at first that putting the microwave in a house-off controlled outlet will give them the dreaded blinking 12:00 every time they power back up. Ideally, it would allow the convenience of each individual wall socket to be toggled between house-off control and always-on modes; but even then, users would have to be smart about using powerstrips. 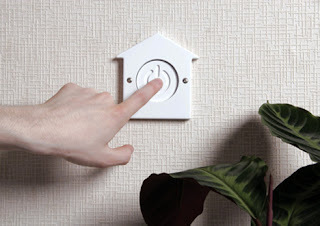 One added bonus is that this could help with safety as well as green living - having this switch control the oven, stove burners, and iron socket could quell that nagging "did I leave the oven on?" fear! In the end, this is about matching controls to usage patterns. People need to shut down their houses when they leave, so make a control for it. (Just like people might want all-open, all -closed, or leave-cracked buttons for car windows and sunroofs?) The things people want to do and the things people should do: make them easy to do and make them satisfying to do. And they'll do it!